Here's an interesting read...Imitation is indeed the sincerest form of flattery. The link to the entire paper is below the abstract. We analyze the performance of Berkshire Hathaway's equity portfolio and explore potential explanations for its superior performance. Contrary to popular belief we show Berkshire's investment style is best characterized as a large-cap growth. 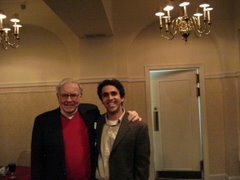 We examine whether Berkshire's investment performance is due to luck and find that beating the market in 28 out of 31 years places it in the 99.99 percentile; however, incorporating the magnitude by which Berkshire beats the market makes the “luck” explanation unlikely even after taking into account ex-post selection bias. After adjusting for risk we find that Berkshire's performance cannot be explained by assuming high risk. From 1976 to 2006 Berkshire's stock portfolio beats the S&P 500 Index by 14.65%, the value-weighted index of all stocks by 10.91%, and the Fama and French characteristic portfolio by 8.56% per year. The market also appears to under-react to the news of a Berkshire stock investment since a hypothetical portfolio that mimics Berkshire's investments created the month after they are publicly disclosed earns positive abnormal returns of 14.26% per year. Overall, the Berkshire Hathaway triumvirates of Warren Buffett, Charles Munger, and Lou Simpson posses' investment skill consistent with a number of recent papers that argue investment skill is more prevalent than earlier papers suggest. Anyone fortunate enough to have invested during the bull market that began in 1982 will find easy to say "buy and hold forever." Indeed, for almost twenty years, the market had one general direction - up, and anyone who bought and forgot did well for nearly 18 years. Warren Buffett has described the bull market that began in 1982 as a period unlike any other for the markets and that it is highly unlikely or quite some time before the U.S. markets experience that again. And although Buffett is famous for his "our favorite holding period is forever" line, it wasn't until later in his investing career - when Berkshire's capital was enormous - that this approach really made the most sense for him and Berkshire Hathaway. Consider that from 1983 until 1999, the average annual return on the S&P 500 was 15.7%, assuming the reinvestment of dividends. A similar return like this for the Dow Jones beginning in 2008 would mean that the Dow would be trading over 139,000 in 2024! It is in this context that I found Active Value Investing: Making Money in Range Bound Markets by author and portfolio manager Vitaliy Katsenelson an interesting and insightful read on understanding the long mood swings of Mr. Market. One should not assume that the word "Active" in the title to suggest market timing - this is the last thing Vitaliy is concerned with. In fact he readily admits that trying to time the market is a fools game. Instead his focus on using fundamental valuation techniques - discounted cash flow analysis, price to earnings models, and margin of safety - to take advantage of range bound markets. Any serious participant in the stock markets is well aware that markets trade in in ranges some periods longer than others. During the 16 year period beginning 1966 and ending in 1982, an investment in the Dow Jones index in 1966 would have been worth about the same sixteen years later. Hovering around 1000, the Dow remained around 1000 in 1982. Whatever dividends you earned were wiped out by inflation during that time. A simple buy and hold approach during that time would have produced an annual rate of return of zero percent. Yet during that sixteen year period occurred one of the most opportunistic buying opportunities in the U.S. Beginning in 1974, as Buffett so famously quipped, "I was selling at 3 times earnings to buy stocks at two times earnings." Active Value Investing discusses how the prudent use of fundamental analysis allows to take advantage of such opportunistic times in the market. Focusing on the only three variables that really matter in a business - value, quality, and growth - investors can learn how intelligently exploit Mr. Market's mood swings. Unlike most great investing books that are focused on the buying process, Active Value Investing takes a very close examination of the selling process, something I find to be the most misunderstood area of investing. Make no mistake, if you can't buy at the right time, knowing when to sell won't mean much. Not only does Vitaliy walk you through his framework of knowing when to buy stocks, but he also takes a deep look at selling stocks, a topic not given enough discussion among value investors. Active Value Investing looks to change all of that. We all realize that the markets are never a smooth ride and that market timing is mere folly. The key to taking advantage of the market's swings - buying on the stalls and selling on the surges - is to focus on valuation of individual securities. Indeed it is the price in which you buy that ultimately determines your return when you sell. Understanding what to look for in businesses and how to value them is an absolute must if you hope on succeeding in the markets for a meaningful period of time. Active Value Investing helps steer you in the right direction.